Ummm Yeah, If You Could Just Go Ahead And Make Sure You Do This From Now On, That Would Be Great! Micromanaging, we all know the term! The word itself has a bad connotation and all employees usually cringe when hearing it. 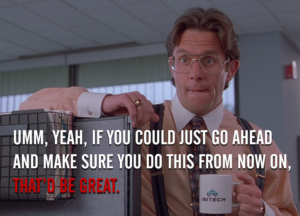 Remember the poster child for micromanagers Bill Lumbergh, (“Ummm yeah, that would be great”) from the movie Office Space? Don’t be THAT guy, obsessing about stapling the cover on TPS reports. However, knowing how and when to be an effective micromanager really can be beneficial. Here is the definition of a micromanager: “A micromanager is a boss or manager who gives excessive supervision to employees. A micromanager, rather than telling an employee what task needs to be accomplished and by when, will watch the employee’s actions closely and provide rapid criticism if the manager thinks it’s necessary.” Start with the caveat that there is a big difference between a “leader” and a “boss” and understand that there is a time and place for management. There’s actually a time to do this! In most workplaces, managers are responsible for training new recruits. This is the ideal time to micromanage. The new employee might lack motorcycle industry experience and it is the manager’s job to get them familiar with their new position and the dealership’s processes. You start by guiding them through the process of the job. You motivate and teach them your dealership’s operations on a “micro” level. Part of being an effective manager is to listen… Sometimes they can have experiences from other jobs and may even be able to improve “your” way of doing things. Even if you have been doing something the same way for 20 years, it doesn’t always make it the best way. Be open to new ideas if your new-hire has them. Some employees get it right away and if you hired them, you must have seen something in them in the first place, right? A problem can arise when the employee has spent a considerable amount of time in their position, yet the supervisor is still closely monitoring their every action. In this case, the problem lies with either the employee or the manager. At this point, it is time to dig in and find out whether the employee is just incompetent or the manager is unwilling to let go. If you (as the manager) have tried to empower the staff member to do the job independently and they failed, then you might want to relieve them of that position. At that time, you can refer to the February 2016 issue of MPN when we covered interviewing techniques. On the other hand, if they are fully capable of operating on their own, it is time for you to give them independence in their work. • You ask frequently for updates on projects… how are those TPS reports coming? Letting employees work on their own reflects that you trust them enough to finish what is expected of them. In return, you can focus on more important tasks, like hitting targets, serving customers, meeting deadlines, etc. The employees gain experience and the operation is able to progress as a whole. Overall, micromanagement involves an extreme approach to hands-on management. These managers can cause major problems in production and efficiency. Too much oversight can demotivate workers and cause them to lose confidence in their abilities rather than improving efficiency and productivity. Additionally, managers who are too involved in employees’ work may not be performing their own roles adequately. A good manager typically spends significant time planning strategies, training and coaching employees. Taking on work that should be delegated distracts from these activities. If uncorrected, micromanagement leads to low employee morale and attrition. Ummm, yeah, if you could just go ahead and make sure you do this from now on, that would be great!